So the last exercise had us typing in characters to help us understand what lines would be printed to the screen and which ones wouldn’t. The character used is the ‘octothorpe’, aka ‘pound’, ‘hash’, ‘number key’, hey, whatever works for you. The important thing is that wherever it appears, any character that follows on after it doesn’t get run in the program. 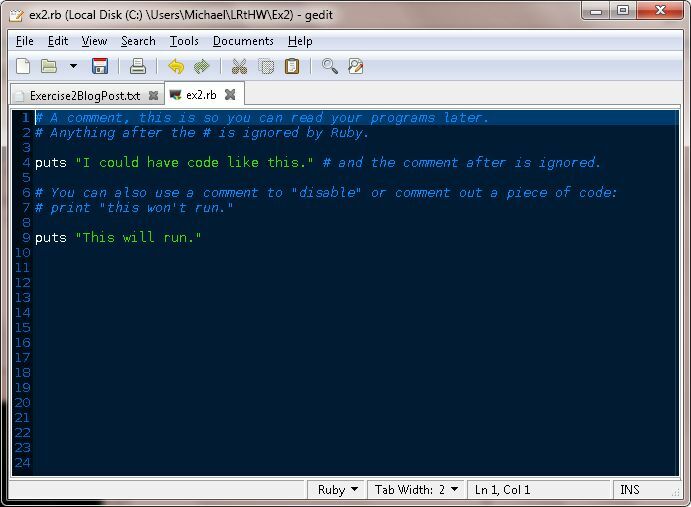 It’s used for commenting your code and for disabling lines in your code. So here’s the exeercises as dispayed in the book and what I see when I run them. – Find out if you were right about what the # character does and make sure you know what it’s called (octothorpe or pound character). 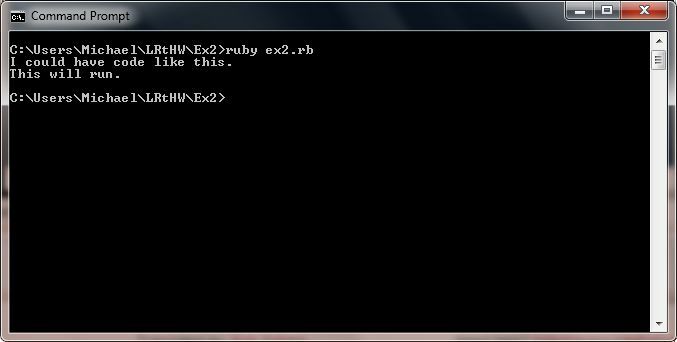 – Take your ex2.rb file and review each line going backwards. Start at the last line, and check each word in reverse against what you should have typed. – Did you find more mistakes? Fix them. – Read what you typed above out loud, including saying each character by its name. Did you find more mistakes? Fix them. OK, seriously, did Zed really make me just do that? Does he think I’m really that stupid? Well, no… and yes. You see, in reality, we are that stupid, if we are inexperienced or we are not really good typists. We think we have typed our information well. We think we have done everything right, until we actually run the program and it gives us output that we don’t expect, or we get an error. By reading the code backwards, we can see if, indeed, we did write what we believe we wrote. Remember, the human brain can make sense out of a lot of static, and it’s very helpful when it comes to filling in the blanks and letting us see what we think we mean. I see this all the time with my own blog posts. I proofread them, sometimes two or three times, only to have another reader spot a glaringly obvious error that I overlooked. Why? Because my brain knows what I mean, and it is more than happy to fill in the blanks. Computers can’t do that; they have to be told explicitly what to do, and even elegant layers of abstraction, of which Ruby is, cannot overcome that. If you tell the computer to do something, it will do it, whether you meant to tell it that or not. It doesn’t understand intent. So yeah, Zed wants you to proofread even these simple starter programs. You may be surprised how many flaky things you do and do not realize at all that you are doing them.